Alfred Hitchcock's "Rear Window"(1954). They just don't make movies like this anymore. 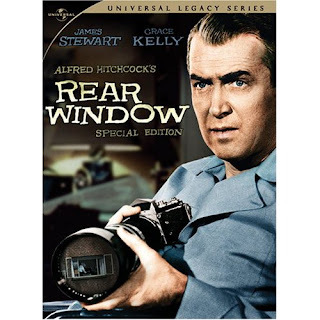 I just watched "Disturbia" which was loosely based on "Rear Window", and it made me think of this movie. "Disturbia" was a big disappointment. Yeah, it was full of thrills and shocks, but it left nothing to the imagination, it did very little to build suspense. It is not about what you see that is scary, but what you don't see. "Rear Window" is a movie that you will want to watch over and over again....and if you have never seen this movie in widescreen, go out and buy the collector's edition now.....because you haven't seen this movie until you've seen this pristine, restored version on DVD!